Children's author, Pam Calvert, used to teach chemistry and physics to high school students before she began writing for children in 1998. Since then, she has taught writing to elementary students, grades first through eighth and speaks to thousands of elementary students each year. 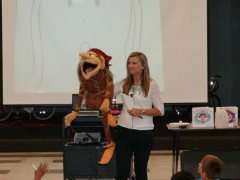 She fine tunes her presentations to fit the skill level of the children she presents to and is comfortable with both young and older children. Her gift in the magic of science comes through her dynamic performances which make students of all ages demand more! 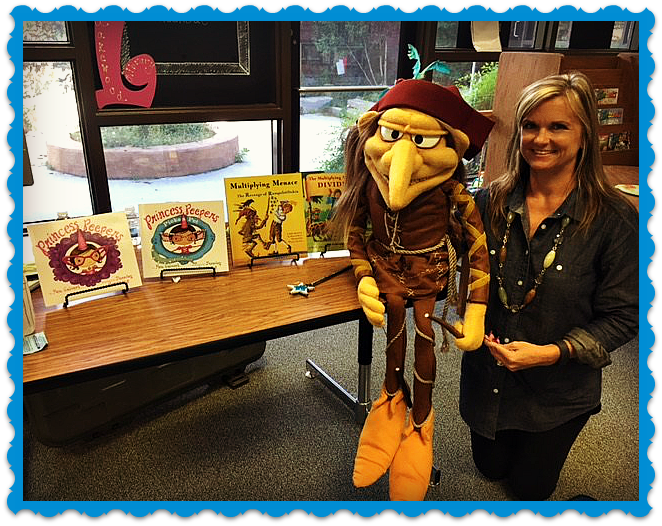 Not only does she inspire children to succeed in their dreams, but she also encourages children to love math through the use of literature. Multiplying Menace is now a Scholastic Math Reads title! You can find it here: Math Reads as well as any online bookstore or educational outlet! A student and teacher favorite! Pam starts off her program with an exciting science experiment which will inspire children to achieve their dreams. She reads her book, outlining multiplication concepts in an interactive way. 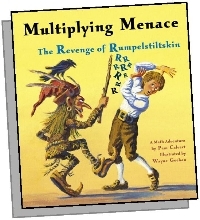 The puppet, Rumpelstiltskin, from the story, Multiplying Menace: The Revenge of Rumpelstiltskin, will visit your school and multiply the children's noses! This will actually teach young children how to multiply! Rumpelstiltskin puppet designed by Jim Henson puppeteer, Creature Clones. Picture by Creature Clones. What’s a fractal? Most students will not know until Pam goes through a fun fractal activity that will leave children feeling smart and ready for their next math lesson. Using Pascal’s triangle, Pam will show students how easy it is to create Sierpinski’s fractal--an activity that will underscore odd/even numbers, addition, and patterns. This activity will follow a Power Point presentation of Pam’s math book of either multiplication or division and an exciting “explosive” science experiment which will inspire children to achieve their dreams! An all age student and teacher favorite! 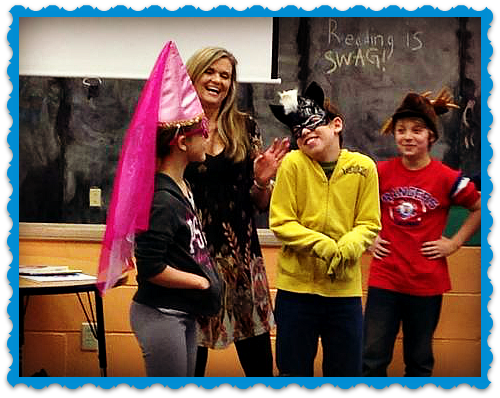 Through a fun, interactive activity, Pam will audition your students for an exciting skit that will show them how to write a story—this activity has a dramatic, funny twist that is sure to leave your students laughing and wanting to write their own story! This will follow a Power Point presentation of one of Pam’s books and an amazing science experiment that will inspire students to achieve their dreams! 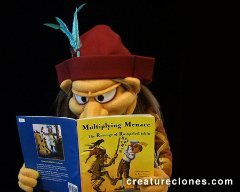 Through a funny yet interesting Power Point presentation, Pam will show how Multiplying Menace or Princess Peepers was produced from imagination to final product. This will follow a presentation of one of Pam’s books, and an exciting “explosive” science experiment that will inspire students to achieve their dreams! Q & A session follows the presentation. Note: Pam will need a projector for these Power Point presentations. Pam's writing workshop teaches students how to embellish their work creatively. As a former UIL writing coach, she uses her professional knowledge and skill to help kids learn how to choose better words. She also goes over ideas for humorous stories, showing students some of the ways she uses humor in her picture books and has them write a funny, one to two page story. Before they write, she focuses on how to creatively use more interesting verbs. By the end of the workshop, the kids go home with a hilarious story they will be proud to show others. If there's time, the students are encouraged to share their work. Since Pam was also a 1st through 8th grade writing teacher, she will fine tune her writing workshop to the needs of the teachers. She can teach students how to embellish creative nonfiction essays as well. Make sure to specifically ask for this workshop when contacting her. Thank you Pam for coming to visit our school and for your amazing presentation on "How to Write! writing workshop" ...The reiteration of spicy verbs, strong word choices, use of similes and much, much more was very helpful... Thank you for your support to teachers. Note: Pam will need an overhead projector, document camera, or Smartboard for this session. Texas children's author, Pam Calvert, lives in the Houston, TX area. Any visits outside her local area (1 hour 30 minute radius from her home north of The Woodlands), will incur minimal travel costs. As she has friends and family in most areas of TX, she usually will not require a hotel fee. Teachers! Here is an activity guide for Multiplying Menace. Enjoy! Here's a Princess Peepers Activity: Fun Eyewear! Pam offers each school Visit Guidelines, Helpful Hints, Teacher's Guide (for Multiplying Menace only), and 40% off of the list price (when ordering directly through publishers, otherwise, it's list price). Please allow at least six weeks for ordering books. Need more writer's workshops? You may substitute any sessions for workshops. $895 out of state visits plus travel expenses. 4 session minimum. $100 discount for full day fee only for all Title One schools. $200 discount for full day fee if a school brings in two or more schools along with them. Each school will receive this discount as well. For four session visits only. Please contact Pam at pam@pamcalvert.com to book a visit! Please contact Pam for conference fee information. Here’s what schools are saying about Pam’s visits! THANK YOU to Pam Calvert, the children's author that visited our campus today. She was outstanding! The students and teachers are still talking about how much they enjoyed your visit! That was one of the best, if not THE best presentation I've ever seen! Thanks for the visit. We loved it! "I can't thank you enough for your wonderful school visit. The kids were excited about both your book and your presentation. I heard nothing but positive comments from the teachers. They enjoyed your connection of reading, writing and math. You engaged the kids beautifully. You're one of those people who really 'gets' kids. We were so lucky to have you visit our school." "Thank you so much for speaking at our school! You inspired many students with ideas for writing! Your book is very clever, and the discussion on not making it so easy for the main character to solve his problem was timely! The fraction lesson was timely, too. Thank you for sharing your gift with us!" "We got many teacher compliments on your presentations and the kids said it was the best! "I wanted to thank you for your visit last week. All of us enjoyed meeting you and listening to your presentation. The kids thought it was very funny." Thank you so much. The kids really enjoyed your presentations. Good luck with your move to Texas! Don't know how to do a Skype school visit? Click here for more information: Met Any Good Authors Lately? Schools like my Skype visits, too! Thank you SO MUCH for skyping with us! It was WONDERFUL! We really enjoyed it! And, we can't wait for your new book(s) to come out! Thank you so much for taking the time to meet with my students and I yesterday. They had a wonderful time and are still very excited! :) It was a great experience to see that "real" people write books. :) I work with a number of struggling/resistant learners and am desperately trying to instill a love of reading/writing. Your presentation was very helpful to see that no one is perfect when writing! 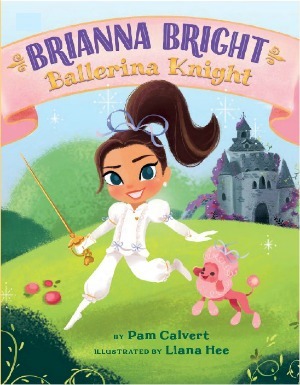 We can't wait to read your next Princess Peepers book!